You may skip them thinking that you're not looking for vintage pieces. However, estate sales are the perfect place to pick-up everyday items at an affordable price. It is important to bring money with you to an estate sale, as you can get the best deal if you can haggle with cash. If you're thinking about finding the best bang for your buck at an estate sale, here are the items that you should keep in mind. 1. Silverware. Purchasing brand new silverware at a local department store can be extremely pricey, especially if you get all the bells and whistles like the serving spatulas, the pickle forks, and the cutlery. It is possible to find stylish, beautiful, and complete sets at a fraction of the cost of other stores, such as Bed Bath and Beyond or Macy's. Before you spend hundreds of dollars on a brand new set of silverware, scour estate sales to find a deal! 2. Big Furnishings. Big pieces of furniture such as bookshelves, credenzas, and buffet tables are more commonly made of particle board than solid wood in today's market. When you do find a piece that is made entirely of oak, maple, or mahogany, you will most likely find a price tag that might shock you. At an estate auction, it is increasingly possible to find furniture made from solid wood costing less than many pieces you'll find at IKEA. 3. Dishware. If you're looking for new dishes, estate sales are the perfect place to go! Regardless if you need something for everyday use or you would like to pick up fine china to set your dining room table, estate auctions and sales often include complete sets of dishes. Buying eight place settings from Target or Wal-Mart typically cost a couple of hundred dollars, so finding a cheaper and higher quality set you can save yourself some money. 4. Table Linens. Linens such as tablecloths and napkins are a staple of any refined table setting. When rummaging through the items at an estate sale, you can find beautiful linens for far less than the discount stores sell them. It makes more sense to purchase dining linens at an estate sale if you will only use them once or twice. Why spend department store prices for an item that will only be used a couple of times? 5. Glassware. 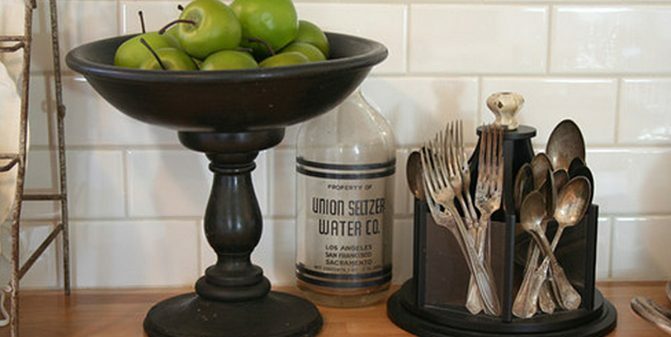 Vintage glassware can add a colorful pop to your kitchen or dining room. When an estate is selling glasses and barware, you can often get them for as little as $1 per item. By purchasing glassware at estate sales and auctions, you can get the glasses you need for your home and have enough left in your pocketbook to fill them with your favorite libations. While you can find an array of items at an estate sale, these five are always worth your time. With such significant savings, it is almost atrocious to spend the extraordinary amounts that department stores charge. You can even find estate sales online saving you a trip! What is the best item that you have ever purchased at an estate sale? This article was inspired by huffingtonpost.com. Check out their site for more insightful information! What is the point of wasting half your day bidding in an online auction if you don't win the item, right? Many people compete in these auctions every day with hopes of winning everything from government used property to estate sale items to restaurant equipment. Whether BCL Auction, e-Bay, or another online platform, we have compiled the best strategies for actually bidding to win. 1. Begin with a higher bid. Typically, people place their first bid as low as they can with hopes of getting the item at a much lower rate. This plan backfires on many occassions, as keeping the bid price low only invites more potential buyers. If you offer a larger chunk at the beginning, you will cut some of your competition. 2. Immediately match bids. When you're fast to provide a higher offer, you essentially intimidate other bidders into thinking you won't quit. This is a psychological tactic that frightens off other bidders. 3. Study your opponent's pattern. Once you know how your competitor's play, you can out maneuver their next move. Do they always bid in round numbers? Do they start small and end big? Vice versa? If you can predict their behavior, your chances of winning increase. 4. Understand when it's over. Overpaying for an item is not in your best interest. If you mark your bottom line and stick to it, you won't end up regretting the process. One foul auction win can be devastating for your funds. It's important to know when enough is enough. 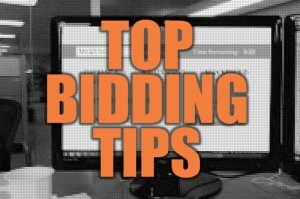 Online bidding is a great way to get items you need at a lower rate that market value. However, don't let the fight to win cloud your judgement. Play to win, but know when it's time to go home. What other strategies do you use when bidding online? This article was inspired by reverseauctionguide.com (http://www.reverseauctionguide.com/best-bidding-strategies/).